TJ Formal Dress Blog: Bethie needs help with sizing! Q: How can I make sure my dress fits me? It is very, very important that you measure yourself correctly so the prom dress you order will fit. Do not GUESS at your size or just order the same size you wear in jeans or regular clothes. 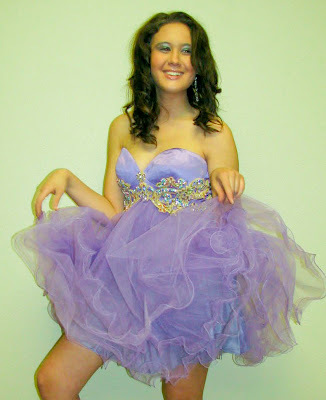 Formal dresses fit very differently and usually run small. Each designer has different measurements for each size, so if you are looking at multiple prom dresses, be sure to check your measurements against EACH size chart to determine your proper size. You might wear a size 2 in Jovani, but a size 4 in Alyce. Unfortunately Bethie didn't measure before she ordered her short prom dress. She ordered a size 2 because that's the size she always wears. Oops! She was very, very sad! 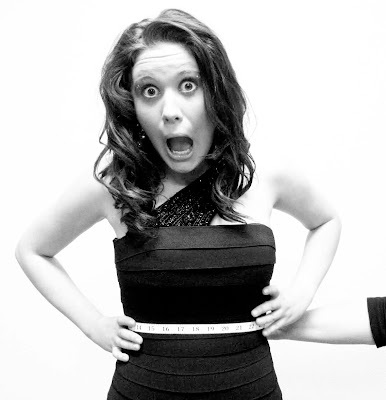 We helped Bethie measure so she could order a dress that fits. Next, we measured her waist at the smallest, or natural, spot, which is usually about 2" above your navel. We measured her hips last, around the fullest part. Be sure to keep the measuring tape level! 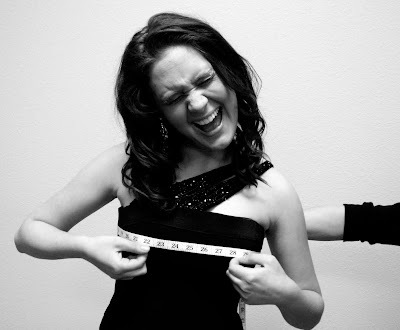 ...but no worries, you can always have a professional seamstress take a dress in! Letting a dress out is much, much more difficult, if not impossible. So it's important to order off the largest measurement, depending on the style of the dress. Now the dress fits Bethie perfectly and she is so happy she took the time to MEASURE CAREFULLY! Check out our Measuring Instructions and Measuring FAQs for more information! Thanks for the information on how to measure. This was so much more fun than reading boring instructions. Haha, I have been there Bethie!! Guessing is no good when it comes to formal dresses. Thanks for the advice! Very cool way to educate us!